3 Peaks Resort & Beach Club in South Lake Tahoe has great lodging at unbeatable prices. We have a great members-only beach available to all our hotel guests. We are two blocks from the Gondola at Heavenly and you can walk to a variety of casinos to have some fun when you're not on the lake or the slopes. Large, wooded grounds run from Park Avenue to the west, Pine to the south and Manzanita to the north. Relax on the benches, BBQ, and picnic areas. The 3 Peaks Resort and Beach Club is one of the most enjoyable and relaxing resorts and hotels in South Lake Tahoe. Our guests at the 3 Peaks Resort & Beach Club will love our large outdoor areas of grass and shade created by our giant pine trees. The property has been fully remodeled to offer the best amenities and luxuries for your dream vacation. Our hotel has everything: from fully equipped cabins to your standard hotel room. Our hotel is definitely one-of-a-kind. We have two Jacuzzis, a heated pool, horseshoes, BBQs, basketball, and more. Don't forget: we have a private beach and easy access to the mountains for summer adventures or winter fun. Our beautiful Lake Tahoe Hotel will be sure to please you in any season, so come and enjoy. Skiers and snowboarders flock to the 3 Peaks Resort & Beach Club in Winter. 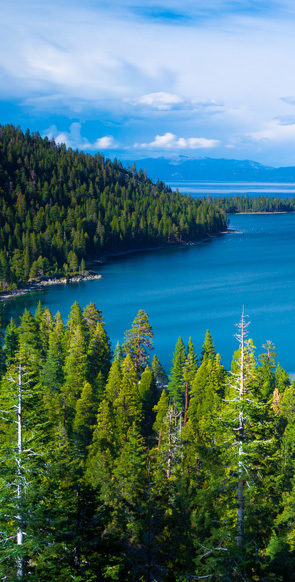 Our easy access to the slopes, dining, and shopping make your Lake Tahoe, California vacation one to remember. We are within walking distance of the Heavenly Village Gondola and a quick drive to five other great Lake Tahoe ski resorts. The 3 Peaks Resort & Beach Club is truly a winter wonderland.